Alex J. Cavanaugh: Exercise Tips, Ninja News, Awesome Surprise, and Thankful for my Readers Blog Hop! Exercise Tips, Ninja News, Awesome Surprise, and Thankful for my Readers Blog Hop! I have the honor of a guest post on Michael di Gesu’s site, In Time! And it’s not about writing or movies or music – it’s about exercising! I work out several times a week (first rule of Zombieland – Cardio) and I outlined a few things everyone can do to stay in shape. So if the Halloween candy attacked you or the approaching holidays and all that food make you nervous, visit Michael now! Nigel G. Mitchell, half of The Geek Twins, has a new release – Dead Links. Congratulations, Nigel!! Hildie McQueen has a new book – Highlander’s Captive – and you can win a $10 Amazon gift card. See her site for details. Congratulations, Hildie! Andrew Leon’s next installment of Shadow Spinner, Part Eight: The Cold and The Dark, is available for free on Amazon now! While he was traveling in Iraq, Osprey Publishing released Sean McLachlan’s latest book. The Last Ride of the James-Younger Gang: Jesse James and the Northfield Raid 1876 came out on October 20. Congratulations, Sean! Nice surprise waiting when you got home. He’s also offering several of his books at a reduced price – check out this POST for details. The Indelibles are hosting the INDIE-giving Blogfest the week of Thanksgiving. See their site for details. 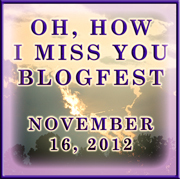 Don’t forget the I Miss You Blogfest is Friday, November 16. We’re paying tribute to the bloggers we miss and the ones we would miss if they were to vanish. Excellent time to show appreciation of your fellow blogger buddies. Co-hosted by Andrew Leon, Matthew MacNish, and me. This Wednesday is the next posting date for the Insecure Writer’s Support Group! Mark your calendar. And either Wednesday or Friday I will have some blogfest tips for you. 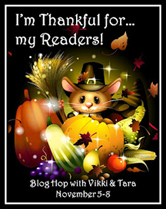 I’m Thankful for my Readers Blog Hop Tara and VikLit. I’m thankful for the readers of my books. When my first book came out, I thought I’ve be lucky if a hundred people read it. I never envisioned that number would swell to five digits. Thanks to everyone who has purchased and read my books. You’ve spurred me to keep writing and I’m honored so many want to share the adventures of Byron. Hopefully the third and final book doesn’t disappoint. I’m thankful for those who’ve sacrificed time as my critique partners and test readers. They’ve suffered through my crappy dialogue and poor grammar! Special thanks to the delightful and energetic Cassie Mae, whose input was not only excellent, it was hilarious! Thanks to the very thorough and thoughtful Rusty Webb, who critiqued my last two manuscripts. His input before I began writing CassaStorm led to one of the coolest characters I’ve ever created. (Not to mention the fact that he’s damn funny as well!) And thanks to Jeffrey Beesler who has also braved two of my manuscripts. You guys made all the difference in the world! Finally, I’m thankful for my blogger buddies and followers. Without you guys, I’d just be talking to myself, and that’s a lonely way to blog! The Ninja Army is my family and this blog the kingdom. And according to the Bible, the Kingdom represents deliverance, righteousness, joy, peace, justice, healing, and wholeness. That is what I want all of you to find here. I may be the captain, but I’m not the ruler – you are. Thank you for being a part of this Ninja family. Visit Tara and VikLit for a full list of participants. Excited about all the new releases? Have you signed up for the I Miss You Blogfest? 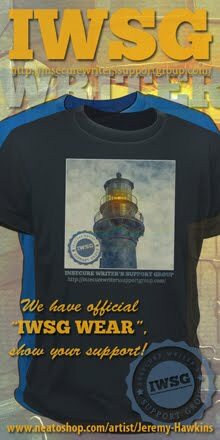 Ready for the IWSG post? Purchased Nancy’s book? And if you could thank your readers, what would you tell them? I like the sound of the James-Younger book! Looking forward to reading your tips on Michael's page. Hoping one of them will be the best way to lift cupcakes to my mouth. I'm signed up and ready to go! I could use some exercise tips. Off to visit Michael now. There's so much here I'll be following your links for hours! Lurker, bet you'll enjoy it. Sean, you're welcome. And it's always good to be home. And hopefully my post at Michael's will be up soon!!! I'm off to Michael's blog, he's supper sweet and I need some motivation. I will NOT mention the weight I've gained in the last few months. Hoping to hit the gym here in a few minutes. I'll see you Wed for IWSG. Nice inscription in "The Mistaken!" My goodness, there's so much going on in bloggydom. Alex, your energy continues to amaze me. Loved your exercise piece over at Michael's. Thanks for the reminder about IWSG - I'd forgotten. Must go now and write the post. If Michael's exercise plan involves running from zombies, I might do well. I could be an Olympian of the Run from Zombies event. If I could thank my readers, I would express my heartfelt gratitude for their support and encouragement. It's humbling, to say the least, to know that others want to stop and see you, you know? What a blessing they are! Thanks to you, Alex, for your support! What a nice surprise for you to receive. So happy for you Alex! I know as a relatively new blogger, I am very thankful for you. Your comments are always so full of encouragement and very postive! That was a great post on exercise Alex. It's always great to remember to be thankful. Lot's of interesting stuff to start the week. I'm signed up for the blog fest and also thinking about the Indie giving one too. Super awesome to be quoted in someone else's book! Ciara, and your account of the road trip with Hildie was awesome! Karen, thank you, and don't want anyone to forget the IWSG. Karen, it is a blessing. Jaybird, thanks - I try! Exercise Tips - I must go check this out. Must read Sean and Nancy's books. Now I need to live to be 105 to complete my TBR list. What a nice 'thankful' note. We're all thankful for you to buddy! Great way to start out a monday with a smile is visiting your blog Alex. I think everyone is just as grateful for you. No Halloween or turkey day over here to catch me by surprise but plenty of zombies...lol! Without readers who comment, blogging is very lonely. All ready for the IWSG this Wednesday. And congrats on the quote in the book. Great to see so much going on-- so energizing. I've loved reading all the thankful entries today-- it IS good to have such a strong writing community. I'm running over to Michael's now, does that count as cardio? Congrats on being in Nancy's book, so cool! your words of thanks were beautiful. so glad you participated! I could use some new exercising tips. On my way to Michael's! What a nice surprise from Nancy! I'm thankful for your blog and for your support! That is so awesome about Mistaken! I bet that made you feel real good. In spirit of the thankful blog hop, thank you for all you do! You certainly bring the blogging community together! What a great bloghop! How did I miss this one? I'm going to hop over and check it out! And we are grateful of you Alex. I do like the idea of these blogfest during November that are all about giving thanks for the good people who keep us going. Very exciting to be mentioned in Nancy's book. Your quote is awesome. Congrats on your quotes in the book and the nice message from Nancy. You are the hub on the wheel of blogging. You draw bloggers in and send out great light. Saw Argo with the boys this weekend. It was terrific. I'm hopping over to Michael's ASAP. I've got to get myself into zombie fighting shape. I'm thankful for you, too, Captain Ninja. Without you, there would be so many fewer awesome writers, new friends and great people in my life. Aww--I love Nancy's note to you. You really do a ton for this community, Alex. Now... off to check you out at Michael's place. How cool that your blurb made it in. Do you feel like Stephen King? I definitely need to check out those exercise tips! I'm ready for IWSG! There are so many good books coming out . . .it's hard to keep up with them all. I think it's great that your quote is on Nancy's book! Loved your comment about Cassie . . .I'm sure she'd have some funny things to say about my "romance" or lack of it in my current novel. I try to walk everyday, but I don't exercise too much other than that. My heart probably wouldn't stand too much exertion due to my arrhythmia. An comfortable walking pace for about 40 minutes a day works well for me. Having steps in my house gives me exercise all day as well--I make many trips per day up and down those stairs. Nancy's book is amazing. I've got my copy and have to send it to her to sign! Congrats to everyone on their releases! Sean's book sounds good. I miss reading Westerns. I signed up for the I Miss You Blogfest, and it's going to be tough to narrow my list down. After blogging for seven years, my list sits at around thirty! Congrats to the authors with new releases! Thanksgiving's sneaking up too fast, I agree. Yes, it's great exercise, I do swimming at least three times per week, is a very complete sport and beneficial. Greetings. Faraway, that's how I feel about my reading list! Siv, I aim to make you smile. Liz, i got you covered! Thanks, Sherry, and it was awesome to receive her book. Thanks, Mary, and knew you'd like the movie. Kind of you to say that, Melissa. Libby, I just hope I look better! Jay, that's a big list. Leovi, wish I had a place to swim. Thanks everyone!! You guys rock. Look at all those great new releases! And what a lovely thing for you to receive in the post. Yay! Headed over to Michael's now. What an awesome surprise! So thoughtful of Nancy to do that. Off to Michael's blog now. Nice present, Alex. Nancy's book looks great! Love the idea of Bloggers We Miss! So many I could name. As always, your blog is chock full of fun and news. I'm getting ready to hop around and check out the contributions for the I'm Thankful blog hop. Getting ready for IWSG post. "without you guys, I'd just be talking to myself." HA! So true. I'm so glad you blog, Alex! It's because of you that I'm hopping, Alex. I know that sounds strange but I feel like I've been rejuvenated as far as my creativity goes. Thanks! See you Wednesday! I am thankful that you wrote the books. Should start number 2 once I finish with Cloud Atlas. Though my oldest wants me to read a book she just finished as well. I guess book recommendations have started flowing the other way. I should have her read your first book. off to recommend on good reads. I wish I'd participated in today's blogfest. I have so many I'm thankful for, including you! Most especially you!! We definitely can't do this alone. Thanks for sharing that. And no, there was no need to ask first. I'm very proud and honored that your name resides on page one of my book. Great pitch to exercise more this morning. With the weather finally cool & misty again, I wouldn't mind a brisk walk. Lots of news and links today. I have my post ready for Wednesday. Blessings on your excellent head, good sir. It must be blogfest season, LOL! Lee, I'm going to have a hard time choosing mine. Maurice, you're welcome. Downloaded it as well. Nancy, the honor is all mine. Suze, thank you very much. How very cool - both the exercise post and your review in Nancy's book. I really need to start working out again. Best of luck to Nancy! Great post as usual. I was too afraid to start thanking people and forget someone. You're not only the wise master, you are brave too. 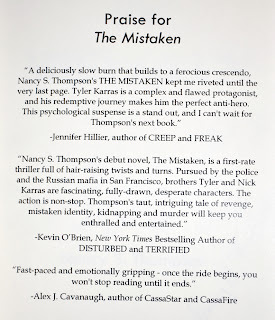 That's awesome you got to blurb Nancy's book! Congrats to the new releases! Such an exciting month November is going to be! So much going on! Woo hoo! I'm looking forward to all blog hops and book releases this month!! Cassie is a real dear. Congrats on getting your quote published Alex you're a real supporter and I thank you in my post as well. hoppin over to michael's right now! This is a good idea for a blog fest. Mine is going up tomorrow. I shall do my best not to be eaten by zombies, but it might get tricky. Elizabeth, that's why I only named critique partners and left the rest wide open. Sheena-kay, I saw that - thank you. Jack, don't let them get you. Your readers are thankful to you too! Reading your blog is always a highlight of my blogging day. That is so awesome :) It's a huge honor; congrats! How I miss you blogfest. It's so true. Last year, at this time of day on Monday at noon my google reader would be out of control but now it's slow to build up, and I didn't unfollow anyone. Wednesday's post is ready. Mostly. I need good exercise tips so I'm off to check it out. I could use a little Alex to slap doughnuts out of my hand. You're a great Captain, Alex. Whew! So much going on today. 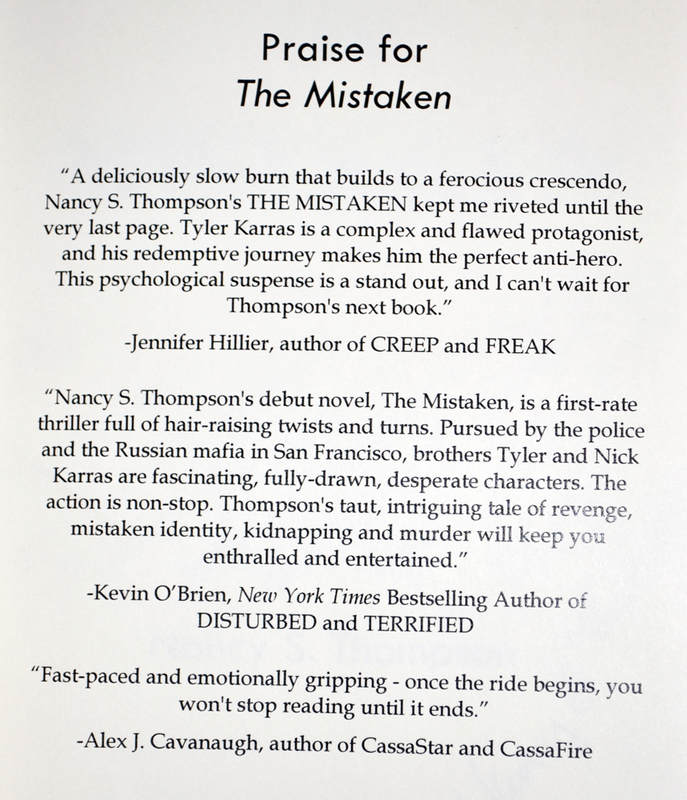 I do have a copy of The Mistaken behind me, and I couldn't be happier for Nancy! :) Also, congratulations to Nigel, Hildie, Andrew, and Sean! Now I'm on my way over to Michael's! Thank you for joining in the Thankful for My readers bloghop, and what a lovely post and set of thanks. A great way to describe a blog as a kingdom and I like the definition you give it. LG, that's good to know! Andrew, I got my copy. Michael, just say no to the donuts. VikLit, thanks for hosting the blogfest! I'll be by Micheal's in a bit - but I think I'll save that one for after my workout (less guilt that way. ;)) Congrats to all the awesome authors and to YOU for the supercool quote! Well, as always, your post is a huge success! A little SNARK goes a long way especially when it comes to exercise. We ALL HATE it, but we are glad we did it. I know I always feel a thousand times better afterwards. Some fantastic news today! Congrats to you ... Nancy's book looks amazing. We should ALL be thankful for our community of amazing blogger friends. I couldn't agree more .... What would we do without them? I cringe at the thought of not discovery this world. Writing and this community has truly enriched my life, more that I could possibly say. We love you Alex becasue you're so awesome (not to mention humble). You deserve every success you've had! Cheers! Just got back from being shaken AND stirred...!!!! Yay for your lovely quote in Nancy's book! Wonderful!! Mark, you will enjoy it! Nicki, at least you are working out. Michael, thank YOU! And this blogging community is awesome. Kitty, did you enjoy Skyfall? Jeremy, I'm all about the snark. Nancy has BEAUTIFUL handwriting! Maybe I should get her to sign my books as me whenever I get that chance, lol. It's gotta be legible, right? I am participating in my first ever IWSG this Wed! I've been putting it off for months but finally decided I needed to stop being a weenie and just get on with it! What would we do without such wonderful people supporting us and our writing? So much to be thankful for. Thanks for the shout-out, Alex! It's very appreciated! Glad I was able to help you out however which way I could! Wow Alex, thanks for the shout out, how cool you are! Exercise, boy I need to do that. I try but can't seem to stick to it. Motivation in that area is sucked out of me by aliens. I think I get abducted every night. Ah yes, that must've been a wonderful surprise on Saturday! That's a great note from Nancy! We can't do things alone when we are on our writing journeys, we need all the support system we can get - that's why we have this fab online writing community besides us cheering us on in the earliest stages and at all the way through the publication stage! Can't wait until the Nov. 16 blogfest and IWSG! See ya then! How cool to receive a surprise copy of Nancy's book. So much love going round the blogging community at the moment. Thank you Alex for your wonderful blog and for being so supportive. That is a sweet note in your "personalized" book. Woot!! Awesome for Nigel. Will have to go tell him congrats. Thank you for all you do to help me and everyone else, Alex. Cassie, no - thank YOU! Camille, welcome to the IWSG! Laura, some of us wouldn't make it. Jeffrey, you've helped with two books and I appreciate it. Livia, thanks so much. That means a lot to me. Suzanne, I'm trying my best. Cathy, fun and cute? That will make my wife laugh. Thanks, Mary. You do a lot as well! Looking forward to the Miss You blogfest! Thanks for posting the Thankful For My Readers hop - I am linking in! Woo hoo! I Iove that we're both in Nancy's book! :) So lucky to know you both. Good news on all fronts. Can't wait to read your blogging tips. Carol, it will be awesome! Jennifer, honored to know YOU two ladies. Tamara, they are set for Wednesday! Alex, I vist your posts, and there are so many links, my day's reading is almost done. Thank you for being such an awesome sharer! You're right about how important those followers and comments are! When I first started blogging I was in the wrong circle and I felt invisible. This group knows how to share the love :) BTW- I finally bought your first book, which has been on my to-read for awhile. It's off to good start! Awww, such a nice thank you to all your readers. So cool you made it into Nancy's book. Congrats on her new release! Congrats to Nigel, Hildie, Andrew, and Sean, too! Rose, I appreciate that! I hope you enjoy it. And this group is beyond amazing. Love all the happy news! What a great surprise you got in the mail. The hop sounds awesome, too. I love the theme. Getting to write a blurb... that is exciting! Looking forward to IWSG and Miss You Blogfest. There is a LOT going on this month! It sounds like you have awesome critique partners. I had not heard of the I Miss You blogfest. I'll have to go check it out. So much happening this November! Mr. Cavanaugh, or should I call you Mr. Ninja, it is nice to finally meet you. I see your name around the blogosphere all the time and I'm only JUST NOW getting around to saying hello. Ah, my human friend, plenty to be thankful for and it is admirably displayed in your most informative, link-filled posting. 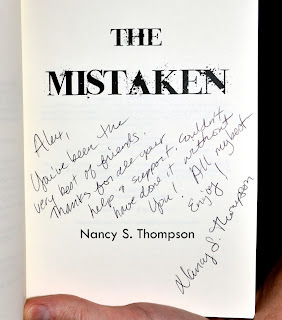 Very nice to see that our friend, the lovely Nancy has forwarded you a signed copy of her book. That's fantastic along with your quote in the book. All the beast, sorry, best, Penny the Jack Russell dog and modest internet superstar! Jess, hope you can join us. Heather, I have amazing critique partners. Christina, hope you can join us! Penny, Nancy is very special. And you're part beast? I never would've known. I love the note-so endearing! I stopped by Michael's - good stuff! Lots of things going on in the blogosphere as usual. 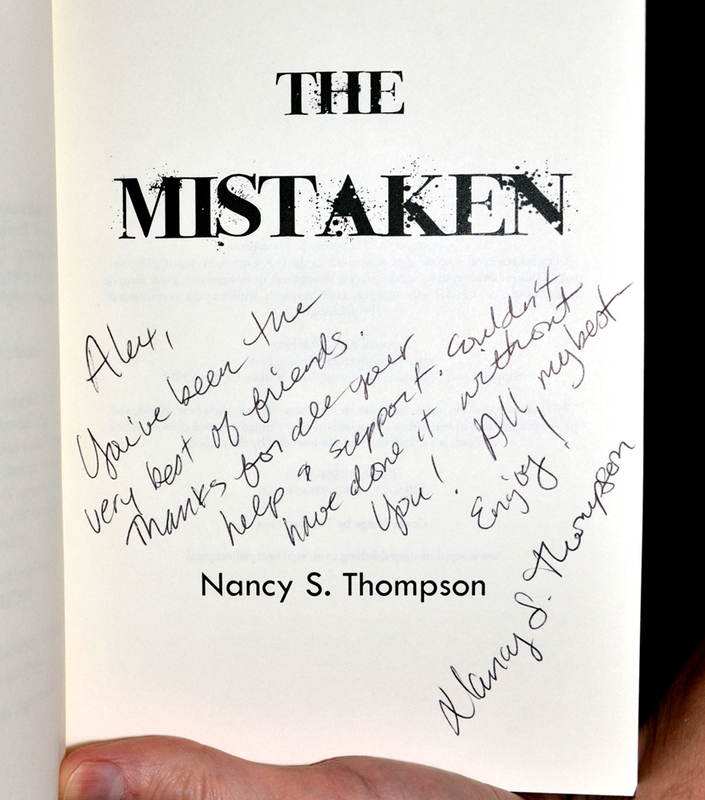 Nancy's a lucky gal to have such great author support! Yes!! I'd already noticed you made it on the quote list for Nancy's book. How cool is that?! Visited Michael's and commented. Late in my visiting today. Sean's book looks interesting, as do some of the others. So much to choose from. . .
That little teaser about a new character in your third book is a good way to whet interest. Climbing out of the hole I dig myself into with my mouth is a lot of exercise for me daily! I'm heading to your guest post now! How wonderful for you and Nancy! And of course I've just hopped over to Michael's In Time blog to check out your exercise advice -- it's solid and sensible. well, you definitely know you've "made it" when your quote is in a book!! awesome!! I'm doing NaNo so I've scheduled my IWSG post - organised or what? Oh thanks for the IWSG reminder! It snuck up on me. We all have much to be thankful with this online cimmunity. It's so awesome. How nice of Nancy to show her appreciation with her tribute to your help. You deserve it! Must go and check out Micheal's post, could do with some exercise tips. Looking forward to the Miss You Blogfest and will be ready for tomorrows IWSG post! Marta, blogfest will be fun! Ella, glad you are exercising again. Alexia, I'm the lucky dude. Lynda, I didn't know it was actually in the book! DG, think you'll really like him as well. Helena, I keep it simple. Tammy, and this is the second time. CM, appreciate your assistance with the IWSG! I can tell from my own experience that a few exercises per week is really good for body AND mind. My wife and I go to gym two or three times per week and since we do that we both feel a lot better. Wow! Lots of good news. Congrats to all! What a nice post, Alex! Did I miss who the co-hosts are for IWSG tomorrow? You will warn us, won't you? I loved your I'm Thankful post and Nancy's inscription to you...off to check out your exercise tips! Your posts are always crammed FULL of information! Love it!! I'm off to check out the exercise tips...heaven knows I need to get off my posterior and get moving. Can't have those zombies out running me! Cheers! See you tomorrow for the IWSG. Great posting and going out the books! I will also definitely check out the page with the exercise tips! Wow, that's a lot of news. How exciting to see you quoted in another book! I am loving all the thankful posts I am seeing out here in bloggy land! Blessings! And what a kick-trash quote that is in Nancy Thompson's book! Way to be awesome, Alex. Edi, it is indeed good for both! Melissa, yes! CM and LG are my co-hosts this month. Jen, just giving you more for your buck. Sangu, don't think I've made it, but it was very cool. I'm going to have a whole week off for Thanksgiving. I haven't done that in years. If I could thank my readers, I'd say, "Do you know how rare you are?" O.o... I have your IWSG post to do tomorrow, and I have this other bloggy thing to do tomorrow for the Resurrection blog fest, and I have an "I appreciate readers" blog fest tomorrow as well...dude, you made wednesdays the most popular day of the week. Congratulations to Nigel and Hildie on their new releases. All the best to Andrew - hope the free days pay off. Nancy is a rock star, isn't she? Nice dedication of Nancy Thompson. Always full of the best news and exciting info! You are like a rock in the crazy rapids my friend. Always there with an encouraging word! Wow! What a wonderful inscription, and congratulations on getting to blurb her book, too. Matthew, enjoy! I'm taking two at Christmas. I have enough vacation I could take almost two months off at this point. Christopher, that is sad, and yet it made me laugh! Michael, time for one heck of a combination of the three! Hi Alex! Guess what? You won the Amazon gift card giveaway! Congratulations! If you would, please contact me at sherry.ellis@cinci.rr.com and let me know where to send it. I love these thankful posts. They truly highlight the wonderful things writers and bloggers do for each other. I'll check out the guest post. So much wonderful info in this post, I can't decide where to visit next. Think I'll start with the "Oh, How I Miss You Blogfest"
Alex, you are the busiest man on the Internet, I do believe. I'm off the check out the interview at Michael's. I love the note from Nancy. That is very sweet. And I'm thankful for you and your blog. You're an inspiration to many of us, Alex. Seeing your name on the first page must be a wonderful feeling. Congrats, its a sign that you have made it big, Alex. Sherry, really? I'll send an email tomorrow. what if we were all attacked by turkey zombies? That sounds like a good comedy horror. I am still working on your book. My wedding and honeymoon got in the way. Coolness on the signed copy of Nancy's book, dude. And a review to boot. Dude, you've made the big time! lol Jennifer is very cool as well. Unfortunately, we weren't able to get together when she was in the Philippines. Hi Alex - your usual great summary via Ninja News .. and then that exercise post up with Michael ..